As we had indicated, it is not a good idea to have your source code in the bin directory. You should create a new directory and keep your source files in that. Basically we are giving the full pathname where javac.exe and java.exe reside. TO simplify the whole process, we can specify the path using a system varialble. To do so you right click "Computer" and select "properties" -> Advanced system settings -> Advanced -> Environment Variables. 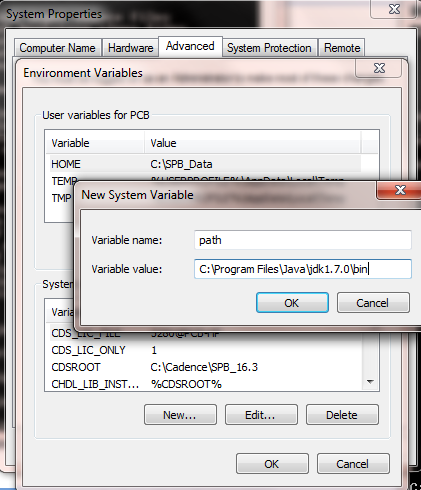 Under the "System variables" click on the variable that says Path and click Edit. Add the ; followed by the path where java is installed in the "variable value" ( it is typically C:\Program Files\Java\jdk1.7.0_17\bin). If there is no path variable, click on new in the System variable - give path in variable name and path where java is installed in the Variable value. When you set the path variable the operating system looks for the binaries first in the current directory and then in the directory pointed by the path variable. This way we can invoke the java compiler from any directory we want. If you are missing something in the path variable here is the step shown in youtube.